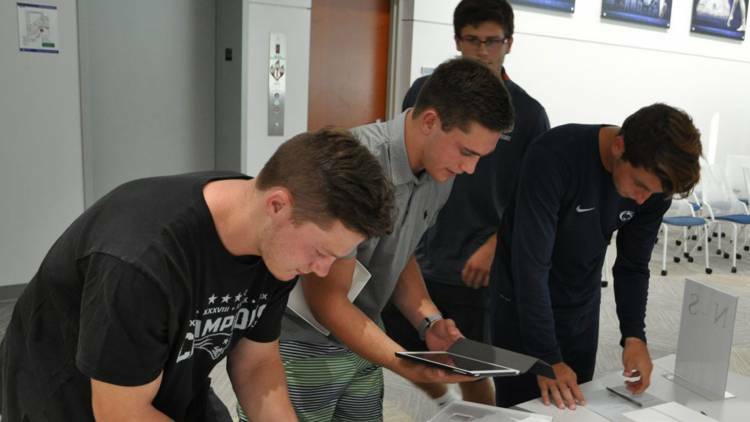 New student-athletes pick up their iPad at the fall distribution event on Aug. 22. Photo by Cody Nimitz. Student-athletes juggle practices, conditioning, and competitions with lectures, studying, and coursework. 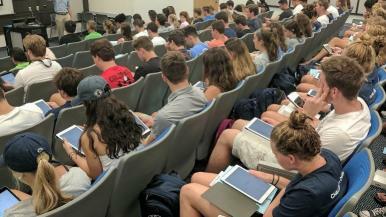 Thanks to an initiative developed by the Department of Intercollegiate Athletics (ICA) during fall 2014, new student-athletes get an assist with a University-issued iPad to make recording lectures, annotating course materials, organizing schedules, and studying on the team bus much more efficient. The devices are configured with quick links to Penn State resources, including Canvas, LionPATH, and Box, and preloaded with a variety of apps for note-taking, study skills, and time management. “When our student-athletes are traveling for competition, they can have all of their academic items in one place and view them offline so they do not need to rely on Wi-Fi,” said Cheryl Anderson, assistant director of Learning Services at the Morgan Academic Center. In the past, managing the ICA Mobile Technology Program involved the loading and configuring of each device and was a laborious process. A year ago, that changed when Intercollegiate Athletics became the first — and now the largest — customer of the Penn State mobile device management (MDM) service. The MDM service, offered by Penn State Teaching and Learning with Technology (TLT), allows any Penn State IT unit to centrally manage their University-owned devices that run on Apple’s iOS platform, including iPads and iPhones. The students learn more about their iPads after taking them out of the box. Stover said when the student-athletes first receive and turn on their iPads, they are automatically directed to the MDM server, pick up the configuration profile, and install all of the initial apps. “We do not have to touch the devices to configure them anymore. The only handling is to affix an asset tag identifying the device as Penn State Athletics property,” explained Stover. If Anderson or the committee identifies a website link or app that would be useful to student-athletes after the devices have been distributed, Stover can push that link or app out to all the devices through the MDM service. As of fall 2017, 19 Penn State units with about 884 devices are now enrolled in the MDM service, including the College of Earth and Mineral Sciences and Student Affairs. About 600 of those are in students’ hands or are used by students. “We’re primarily focusing on devices that get in the hands of students and our faculty and help enable learning,” said Kuwahara. Any units interested in learning more about the service offered by TLT should visit http://sites.psu.edu/psumdm/ for information. This article orginally ran in Penn State's Teaching and Learning with technology blog.